In Connecticut, a person is considered to be legally intoxicated if their BAC (blood alcohol concentration) is .08% or higher. That's a clear line drawn in the sand, if you cross it, you've broken the law. But how do you know when you've crossed that line? Well, it's actually a lot easier than you might think. Granted, it is different for every person, but here's a scenario to show you just how easy. 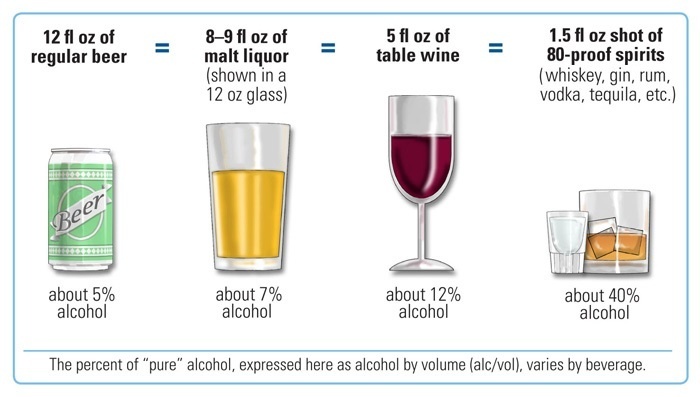 A 150-pound man goes out to a pub for 4 hours and has 2 "standard sized" drinks per hour (Examples of standard drinks can be seen in the image above.) As he drinks, the alcohol builds up in his system. Before the alcohol can be passed through his body, it has to process through his liver. The human liver can process alcohol at the rate of about 1 drink per hour. Not bad, considering you're flushing it with toxins. The problem is that you can easily out drink your liver. So even though each hour, one drink leaves his body through the liver, when he leaves there will still be 4 drinks left in his body. His blood alcohol level will be approximately .13%. That’s well above the legal limit. You can see the problem is compounded with each drink you have. While you might not feel the effects of one, each subsequent drink begins to stack up exponentially. By the time you feel the effects, it's already too late. Anyone that has consumed alcohol knows what a buzz feels like. Put simply if you can feel a buzz you are intoxicated. 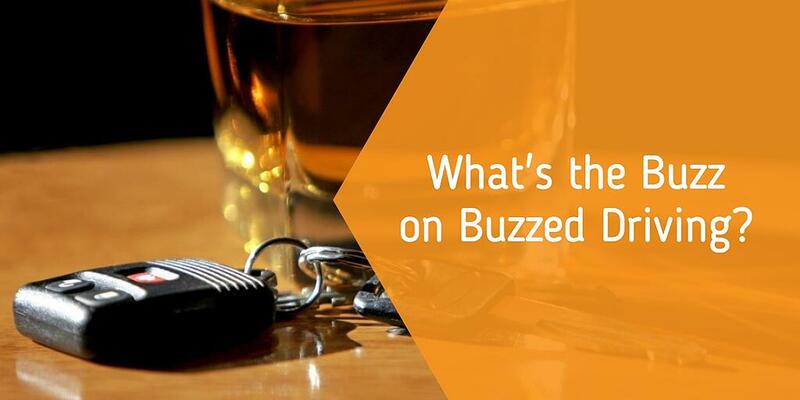 Buzzed driving is drunk driving. Remember that ad campaign? Ok, I drank too much, didn't listen to literally everyone who told me driving was a bad idea, and swerved into a ditch. Luckily no one was hurt. What's going to happen now? Well, what happens next is pretty straightforward. You will be arrested for and OUI, DUI, or DWI depending on your local laws. Your vehicle will be towed at your expense. After you make bail, you will be going to criminal court for your offense where you will receive a fine, a license suspension, a possible jail sentence, an ignition interlock requirement and maybe some community service. You can expect a license suspension of 6 months to 1 year if this was your first offense. Once your suspension is up you will have to pay a $175 license reinstatement fee. After reinstating your license you can only drive a vehicle equipped with an ignition interlock device, which is essentially a Breathalyzer hooked into your vehicle’s ignition system. That's the best case scenario. Remember, in the US alone, someone is injured every 2 minutes in a drunk driving accident. If you are the driver of the vehicle that strikes someone, you can expect your punishment to be much more severe. With all that put behind us I would like to say that no one should ever get an OUI, DUI, or DWI. It's easy enough to avoid. Don't drive if you've been drinking, and don’t drive if you’ve had any drugs that might impair your ability. Even prescription drugs and some over the counter medication can cause you to get arrested. Check with your doctor if you are unsure of the effects of a particular medication. Drive safely. We at The Next Street would like to wish you a safe and happy holiday season. Pledge to be a safer driver this New Year. Download our New Year's Safe Driving Resolution today!